The Pirate Empire: What Did a Pirate Keep in His Chest? If you’ve been reading this blog for a while, you’ll know that pirates didn’t bury their treasure (the exception being Captain William Kidd.) But there are still those chests…. Everyone knows that pirates had chests. What was in them? 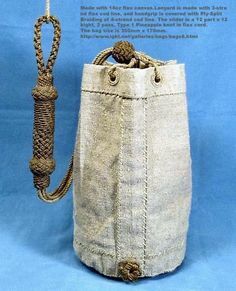 Most sailors carried their things in canvas bags, and a few even did without the bag, bundling everything they owned - A change of clothes, a knife, some small memento of loved ones, spare socks – into their sleeping hammock. The hammock was formed into a makeshift carry-all, and away the sailor went, transporting not only his personal possession, but his bed as well. But pirates had opportunity to acquire more physical possessions . They had money to spend, and in the course of robbing a ship, there was little to keep them from picking up whatever small items caught their fancy. Let’s pretend that we have discovered a pirate chest, preserved from piracy’s Golden Age, and look inside. The first items I think we’d see in a plate and spoon. This seems odd, but pewter plates and silver spoons were things that working class people would scarcely see, let alone own. 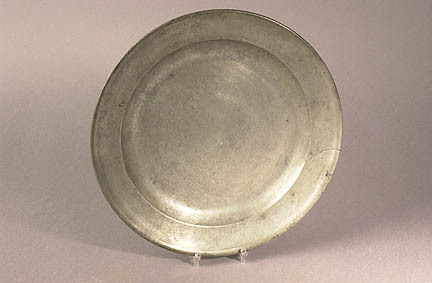 Merchant sailors might receive their food on a wooden plank, or several of them might share a large bowl of food, But a metal plate and spoon? That was the possession of a pirate. Examples of plates on the Whydah included the owner’s initials scratched on the back… probably pride of ownership. Sure beats eating with your hands. Next would be other items used for work on the ship – a knife, and a marlinspike – an iron tool like a small spike, used for working with rope. If, like some new pirates, our friend was a landsman, just learning to sail, his chest might hold scraps of rope with examples of knots he was learning to tie. A sailor’s palm (in effect, a huge leather thimble) might be present if the pirate was a sailmaker or his apprentice. This was a leather wrapping for the hand, with a metal piece – often a flattened coin – attached near the base of the thumb. This allowed the strength of the whole arm to be used in driving a needle through several layers of tough canvas. Our pirate might have items to entertain himself when he was not working. He would probably own a pipe and some tobacco. Tobacco was one of the treasures that pirates frequently stole, and all accounts say that they smoked almost constantly. In sites known to be inhabited by pirates, archaeologists have found hundreds – maybe thousands – of broken clay pipes. The chest might also contain cards or dice. Printed cards were available, printed from woodblocks. The cards were much the same as those today, with the same four suits, and the same numbers, 1-10, with the jack, queen and king. These cards were blank on the back, and were not protected by coatings to keep them clean. A canny card player probably knew more than he should by the stains on his deck. The pirate might also carry dice. Today, you may hear someone say, “Roll those bones!” when rolling dice. In the 18the century, dice were actually make of bone. There was no standard size, and the dice were usually only as square as the human eye and hand could make them. No precision measuring! Of course, pirates ships did not encourage gambling. If one pirate won too much, or another lost too much, it would create bad feeling among the crew. So crew members might have crafts – wood carvings, small musical instruments such as an ocarina, or even embroidery. 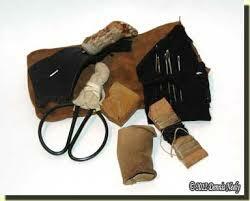 Every sailor did carry the equipment for repairing his own clothes. In fact, sailors were known to be very good with needle and thread. Supplies were often made into a small kit called a “housewife.” Needles, thread, spare buttons, scraps of cloth suitable for patching clothes were wrapped in a bit of cloth and string. The kit would also contain bee’s wax. This was an important way to preserve the thread. Natural materials are prone to rot when warm and damp (exactly the conditions on a Caribbean ship.) Wax would b rubbed onto the tread just before using it, to fend off water. This made the stitches last much longer. The pirate’s weapons needed to be handy, but a secure place on the bottom of the chest would do. 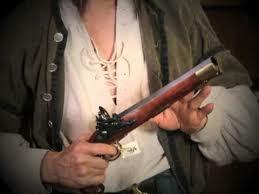 Pirate law said that all weapons must be ready at a moment’s notice, so a pistol would be clean and loaded, but not cocked. This way, the gun would not go off by accident. But pirates didn’t use their weapons every day. Even a successful ship rarely encountered more than one potential victim every ten days or so. And what about the money? Well, if the pirate had that, he would be in port, spending it. A pirate didn’t need cash until he left the ship, so all the ship’s plunder was kept by the Quartermaster. This individual had as part of his job the measurement, recording and distribution of plunder. For ease of accounting, pirates usually left the money with him, and he held it for them until they needed it. Kind of like a pirate Credit Union. The "housewife" reminds me of the most moving things I saw in the Mary Rose exhibition, many years ago: a sailor's sewing basket, with his kit and scraps of cloth and ribbons still in it. Some of the ribbons looked just like ones I had at the time. Robert Newton, in my opinion. was the greatest pirate actor of all time. He is truly missed.